It seems that the big question of the season is this: What is the true meaning of the Christmas holiday? I have heard/read/seen this same question posed over and over again as people try to come to grips with the commercialism of the day. It seems that Americans are struggling to find an answer to the question of why they trim a tree, hang the stockings, buy ungodly amounts of gifts for huge numbers of people in their lives. They are trying to dig down, through the layers of ToysRUs ads and Jingle Bells renditions to find the hidden, holy, secret meaning of the day. I think that I have an answer, if only for those who look back from my own vantage point. I believe that Christmas is a celebration of birth. It is an acknowledgment of the sacredness of all newborns, all over this earth. It is a celebration of the deep and inexplicable love of mother for child, the love that keeps mankind on its endless path into the future. I believe that what is truly holy about this day is that it celebrates the unending desire of all humanity to keep our kind alive. That is the meaning of Christmas. The mother, the father, the grandparents, the loving aunts and uncles, the cousins and siblings and neighbors and teachers and coaches who all dedicate their love and support to seeing each child grow and thrive and come to maturity. Christmas is about our willingness to look to the future. It is about our ability to continually keep our eyes focused on what mankind will achieve. It is a holiday of hope. For it is the ultimate act of hope to have a child in this day and age. It is a statement of belief and optimism to give the world a new little human, bearing all the tender and anxious love of his parents and grandparents. 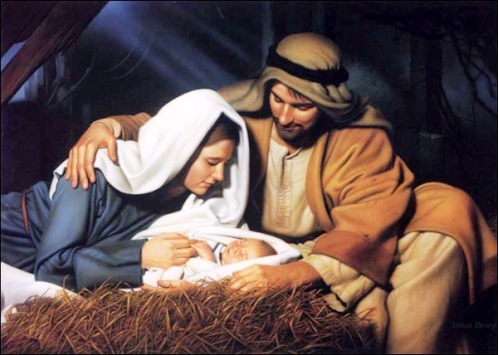 Christmas to me will forever be a holiday which is embodied in the phrase “near her heart she gently folds him”. Christmas is in honor of procreation. It celebrates the future, because it celebrates new birth.